Venture outdoors this fall to celebrate the many bountiful harvests in Mesa, Arizona. The annual Schnepf Farms Pumpkin and Chili Party has something for all ages, as it was voted the Best Fall Family Event in the Valley by Phoenix Magazine, New Times, and Sunset Magazine. Corn mazes, hayrides, a zip line, and carousel rides are sure to work up your appetite for some delicious chili. Stop by the pumpkin patch, but be sure not to miss some of the entertainment including Hillbilly Bob’s Pig Races, the new Gypsy Time Travelers show, and Extreme Canines Stunt Dog Show. For true thrill seekers, climb aboard for The Outbreak, their nightly zombie paintball hunts. Oct. 1-30, 2016 on Thursday, Friday, Saturday, and Sundays. Celebrate this year’s harvest season at Queen Creek Olive Mill. 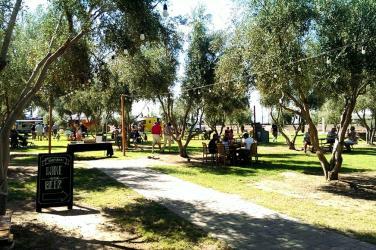 Take their Olive Oil 101 course, enjoy the scents during their cooking demos, and dance along to the live entertainment. Watch the cold pressing process before your eyes as the mill gets ready for their new batch of oil. See olives mix with local citrus, herbs and other natural ingredients for their famous and popular infused oils. Harvest season begins Oct. 15. We love fall-owing your festivities on social media. Tag your photos with #VisitMesa for us to share. Planning to stay for our full harvest season or even through the winter? Mesa has plenty of activities to keep visitors busy during extended stays. Check out Coyote Landing Condominiums, Cal-Am Resorts and Residence Inn Phoenix Mesa when planning your trip.